There’s always the holidays to make certain dishes that we don’t always get to have during the rest of the year. But these days, it’s not always so. During the holidays, my father(God rest his soul) always had a goat and chickens butchered for us and the rest of his extended family. 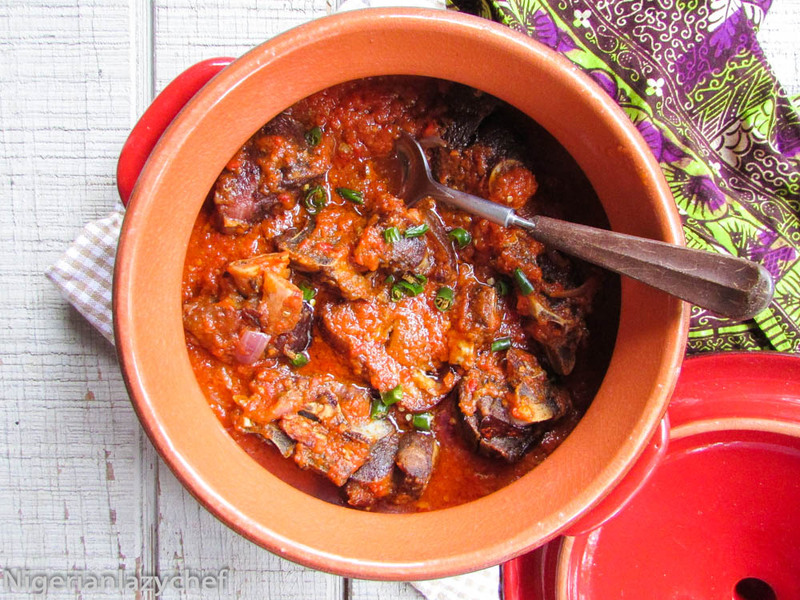 Apart from the goat meat and offal pepper soup, there was always the goat meat stew. This stew was always prepared by my mother and my father’s sister (may God rest her soul). It was made with fresh tomatoes and red rot pepper. During those times, the kitchen was at the back of my father’s house and all I did was watch from the window of my mother’s bedroom until I was old enough to help in the kitchen. Helping in the kitchen was never my strongest point. I was made to crush the tomatoes and peppers with the mortar and a pestle. Tedious? Absolutely! And it made the cooking process take a whole day. If there’s one invention I’m utter mostly grateful for, it’s the blender. Imagine just whipping the tomatoes and pepper into a puree and pouring them straight into your oil. Growing up Nigerian was adventurous. We had to be creative in the kitchen when we had no appliances or power to get the appliances to work. We used the grinding stone to crush peppers, beans, tomatoes, onions…everything. And if you were lucky, your parents helped with an easier way out by paying the local mill to help puree or grind these ingredients. I remember paying 10Naira to blend tomatoes for stew while in the city. But in my father’s country home, the market place was very far, so we had no other option than the mortar and the pestle. Despite all of these, there was still joy amongst us as a family because it was Christmas and we got to eat fried goat meat. After the goat was butchered, we split it into different parts. 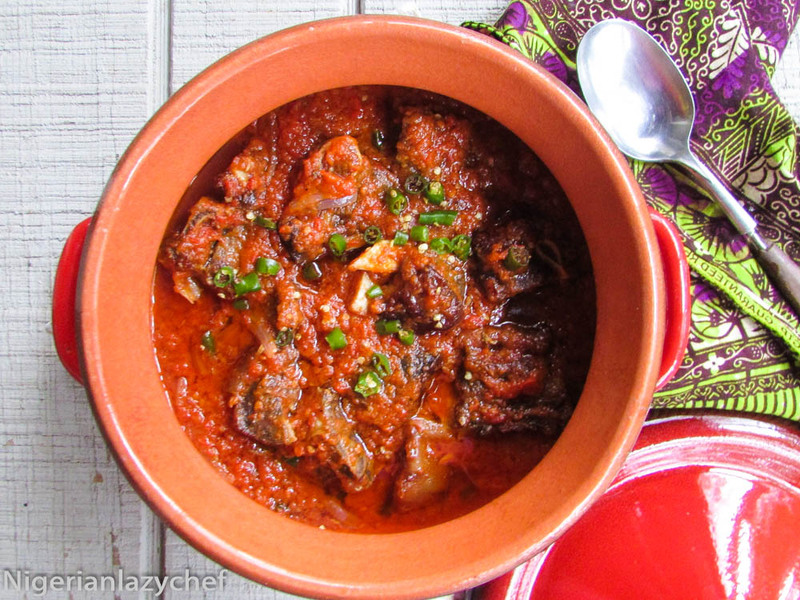 The offal was used to make a simple pepper soup and the head if not used for Isi ewu, it was added to the pepper soup. The remaining meat was split into different parts and shared amongst my dad and his brothers. Sometimes, my dad had my mother cook a pot of stew and the whole clan was invited to have Christmas lunch with us. One thing my father never did was eat by himself. The recipe below is my mother’s recipe that has been tweaked and made easy by me. Naturally, the recipe calls for only tomatoes and the tomatoes were never really smoothly crushed. But with the different cultures in Nigeria, I have decided to add bell peppers which really wasn’t my mom’s or an Igbo thing. (The Igbos are not really known for their stew or adding bell peppers to it. The Yorubas are experts in preparing delicious pots of stew with red bell peppers that slay to the heavens.). 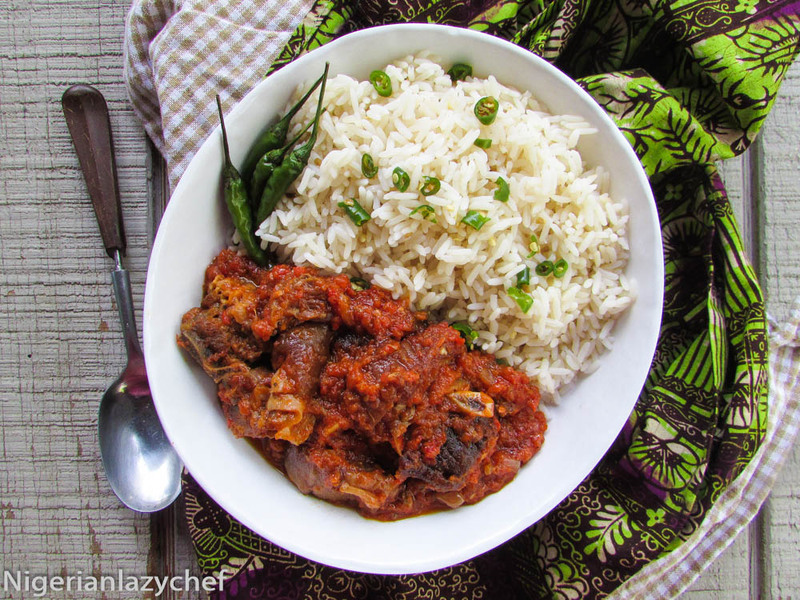 Growing up in Nigeria, goat meat wasn’t something we ate ordinarily and on a daily basis, but these days, you can make it for Sunday dinner and for Thanksgiving. It’s one of the main side dishes on the dinner table during the holidays. Pour the meat and seasonings into a cooking pot and let it cook in it's own juices. Once the juices are dry. add some water and taste for seasonings. Then let the meat cook until soft. Alternatively, pour water into the pot with the seasonings and meat and let it cook until soft. Drain the meat from the stock and fry or place in an oven to grill until golden brown. This entry was posted in Nigerian sauces, Side dishes, Uncategorized and tagged Nigerian food blog, Nigerian goat meat stew, Nigerian stew. I normally prepare Ofe Akwu and Nsala soup with goat meat, I rarely use it in my Stew. But, I like this and will try and prepare it very soon. I just did it, delicious. Thank you!!! I’m about to make this now. I’ll let you k ow how it turns out in a bit. Thank you for making this recipe easy for me I am an American who is married to an African man …. It’s not easy for me to cook African dishes .. I’m still learning thanks again! I am about to make this dish the only thing I have plum tomatoes . Will it make any difference? And the dey pepper is that the same as cayanne power? So I made the dish and my husband loved it he even want me to make it for him mom !!! I am feeling more confident and I’m looking forward to make many more great dishes!! Hello ma’am thank you for sharing your recipe. I am curious about how long do you allow your goat meat to cook before you consider it soft/done. I would just like to have an idea. Thank you kindly. I cook my goat meat until I know it’s soft enough to my taste. Hi, every goat meat is different. I just poke it with a fork to make sure it’s soft to my taste. I’m going to make this tomorrow but I was wondering, could I substitute the goat with chicken? If so, do I need to change anything? I typically get the goat from my mother but she isn’t in town. Thank you so much! I’m sharing your site with all of my American born, first generation Nigerian friends and family. Can you use the meat stock from the goat meat? Hello. I know this recipe was a posted a while ago, but can you please clarify at which point you add the bouillon and salt?